I love electric guitars. I love to play ’em, I love to look at ’em, and I love to listen to ’em. I think the guitar is one of the most versatile instruments there is and so one day, I decided I needed to try building one. Now I’m not particularly handy so I didn’t have any illusions about cutting and routing my own body blanks or working with a raw, unfinished neck. I thought I would start simple and if things went well, great, maybe the next time I’ll go further. But for my first project, I thought I would try to buy stuff with some of the hard stuff done. In this blog, I’ll talk about my luthier adventure and I’ll post regular updates and lots of pics. You’ll hear the straight dope on what worked, what didn’t, and what I’d do differently next time. There are a lot of different styles of guitars out there. So what to build? I’ve always been into Fender guitars. There is no logic behind this – many of my favorite guitar players don’t play Fender – I just like the look and the simplicity. The heart wants what the heart wants. I own a few guitars but this one is my favorite guitar to play. The neck is a flattened V with a smooth satin finish, it has a mid-range boosting amp built in, a blocked tremolo, and I just love this guitar. Eric Clapton did too, since this is a Fender Custom Shop copy of “Blackie” the guitar he played for many years. Here is another Strat I own. I bought it because I like the bridge humbucker. And because everyone should own one red guitar. At the same time, I’ve always thought Strats looked common. They are super comfortable to play, not expensive, and very versatile so it is no wonder that they are so common but the guitar whose look I like the best is this one. Yes, apparently in the 70s (1972?) Fender built this guitar, a Telecaster Deluxe and this is a MIM reissue/copy of that original guitar. It’s a good guitar, pretty inexpensive, and lots of fun to play. But somehow what really grabs me by the humbucker is the idea of the telecaster body and the Gibson style pickups and controls. So I decided this look will form the basis for the Frankencaster guitar I will try to build. I call it a Frankencaster because I will use a modified Telecaster body (modified to have both a forearm cut and a tummy cut), a modern 22 fret Stratocaster neck, Gibson humbucking pickups and Les Paul style controls. Some people think this is like putting a Chevy engine into a Ford but you know what? I don’t care. Yes, good question. 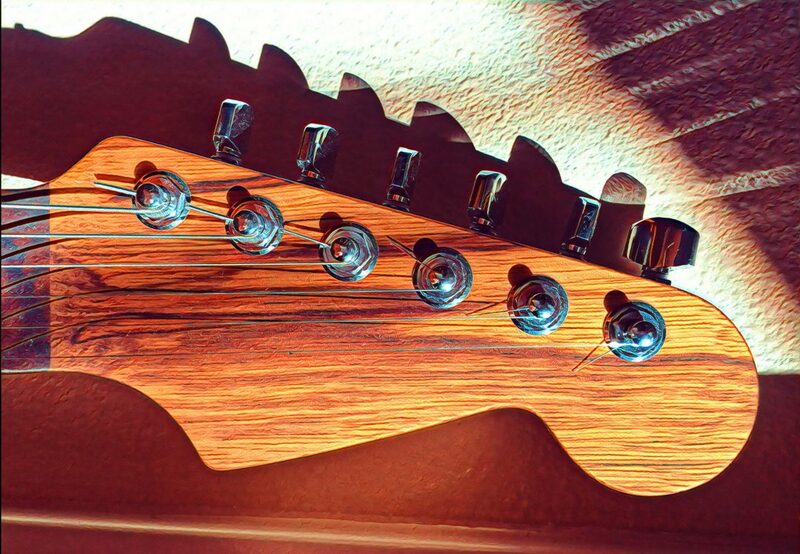 How the heck do you adjust a truss rod? Level a fret? Set intonation? Wire a pot? Aren’t there people to do that? Well, I need to learn it and I have decided to use this book as my guide. Dan, I hope you don’t let me down. Since I don’t want to learn woodworking before building this guitar and since I live in a small apt and don’t have a shop, I need to buy some stuff pre-worked. So my first stop was to head over to Warmoth, where they have a fantastic web site that lets you mock up practically anything you could wish to mock. I bought a bunch of stuff from Warmoth and I also bought a bunch of stuff from Stewart-MacDonald, another great guitar parts and tool store. Here is the single biggest piece of awesomeness I bought – a routed and painted Frankencaster body. BTW, this is a computer rendered image, not something real or physical yet. When I get the real thing, you’ll see it! You should try some P90s in that. That’d be a real Gibson/Fender mashup. I’m not interested in a single coil Gibson look. I like humbuckers!